If you have a hard time getting your kids to brush their teeth, empower and inspire them to take “ownership” of their dental hygiene responsibility, by creating their very own dental hygiene kit with them. It is super easy! In fact, the easier the better! Go to an office supply store with your child and purchase a see-through “ziploc” type pouch. You will want one that is a heavier plastic than a regular plastic baggy of course. 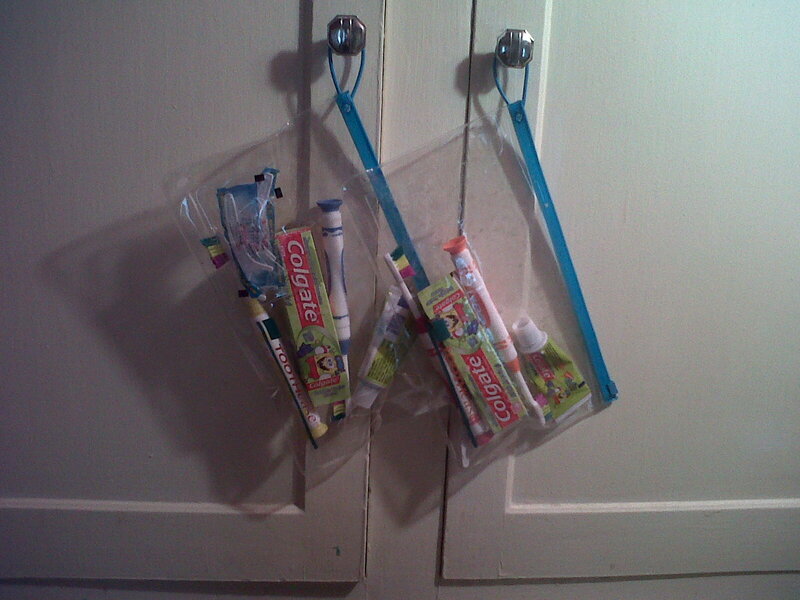 Simply place all of the things necessary to promote their teeth brushing habit inside of their own pouch. Place their tooth brushing kit in a location that is near by the sink that they brush at, or have them keep their dental hygiene kits in their bedrooms. Setting a timer lets them know that they need to brush until the timer goes off. 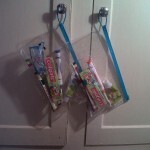 Make a reward chart letting them check off a box each time they brush their teeth. When the chart is all filled in give them a reward. Start setting a routine as early as your child’s first tooth. If you have a set routine in place from early on, your kids will be so used to brushing, they will not fight it. Before you ever buy baby’s first toothbrush, you can wipe new baby teeth clean with a soft cloth. Toddlers who are already used to having their teeth cleaned are often far more receptive to the idea of brushing their teeth later on. When they are 2 or 3 years old, brush their teeth for them for at least two or three minutes. Give kids a chance to brush their teeth as well, either before or after you brush. With daily instruction, children will gradually learn how to brush effectively. Buy a spin brush or a tooth brush that plays a song. (I used this as my first reward for the kids). There are tons of character toothbrushes to choose from. Let the kids pick out their own toothbrush and a fun age appropriate tooth paste. Whether you’re for or against fluoride, looking for the most natural product or just the cheapest, there is one thing you have to consider: taste. A child who enjoys the flavor of his or her toothpaste is more likely to enjoy brushing. Once your child’s teeth come in, you can begin brushing with non-fluoride toothpaste. Allow your child to begin to brush their own teeth with supervision. Once you are sure they will not swallow the toothpaste, you can move them up to toothpaste with fluoride. Many have a line of toothpaste that goes from stage one, non fluoride, and you can move up in the stages as your child ages. Sometimes, all it takes is a toothbrush with a favorite character or one that lights up and plays music to encourage a child to brush. Sing a silly song while they brush their teeth. Make up your own song using your kids’ name. (Like Twinkle Twinkle Little Star can easily become Twinkle Twinkle Little Teeth). Singing special songs can also make the ritual a lot more fun, particularly if you are willing to make a total fool of yourself. 6. Model the habits you want to see. You are your child’s first teacher and role model. Let them see you brush and floss daily, or better yet, make brushing and flossing a family affair. 7. Buy the colored, hand-held flossers. Santa Claus left these in Christmas stockings at the house, and they have been a huge hit! Kids love flossing with them, but make it a rule that they have to brush first, and they will always be eager to brush their teeth. 8. Rely on educational tools. Often, children pay more attention to a message when they do not hear it from their parents. You may have better luck getting those teeth brushed if you read books about dental hygiene or pop in a video like The Adventures of Timmy Tooth.